There’s more to leopard print than 80’s fashion gear and traditional outfits. 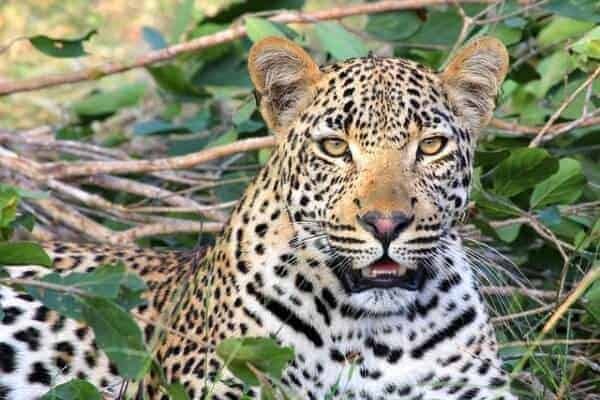 This particular blend of spots and dashes, officially known as rosettes, are extremely effective at ensuring that the leopard remains one Africa’s most sought-after, yet least often seen, member of the Big Five. Add to that the secretive nocturnal habits and shy nature of this powerful creature and you have a recipe for elusiveness that makes spotting one of them in the wild a rare privilege indeed. Although their numbers have declined since the heyday of wildlife in Africa, thanks to the efforts of conservationists in Namibia, our leopard population is still thriving today. You may be lucky enough to spot one of these graceful creatures on safari to a number of game reserves in Namibia, and they are still very much present in the wild too. If you would like to get a closer view though, you can visit the AfriCat Foundation, which is found on the way to Etosha National Park from the capital city. Although leopards are the smallest of the big cats they are, pound for pound, by far the most powerful and able to haul heavy prey species high into the branches of trees to keep them safe from other predators. There are nine subspecies of leopard, found throughout Central Asia, India, and China, but the African leopard is found only in sub-Saharan Africa. Leopards are athletic creatures, capable of running at speeds of 58km/h, they can jump 6m horizontally and 3m upwards, and are adept at swimming. These solitary cats do not tolerate the presence of other leopards in their neighbourhood, except for purposes of breeding, and will defend their territories fiercely. Apart from man, the biggest threat to adult leopards is other adult leopards. Leopard cubs are a nondescript greyish colour and only develop their characteristic dappled coats later on. The average litter consists of two or three cubs, which remain with their mother for about 18 months. If you are staying in Windhoek accommodation during your holiday, the two-hour drive to this predator rehabilitation centre is well worth it to view some of these big cats, along with wild dogs, cheetahs and hyenas. Visit us in Namibia to discover the wealth of wildlife that has benefitted from our world-famous culture of conservation.